This story will appear in the Summer 2018 issue of Western Pennsylvania History magazine, out soon. 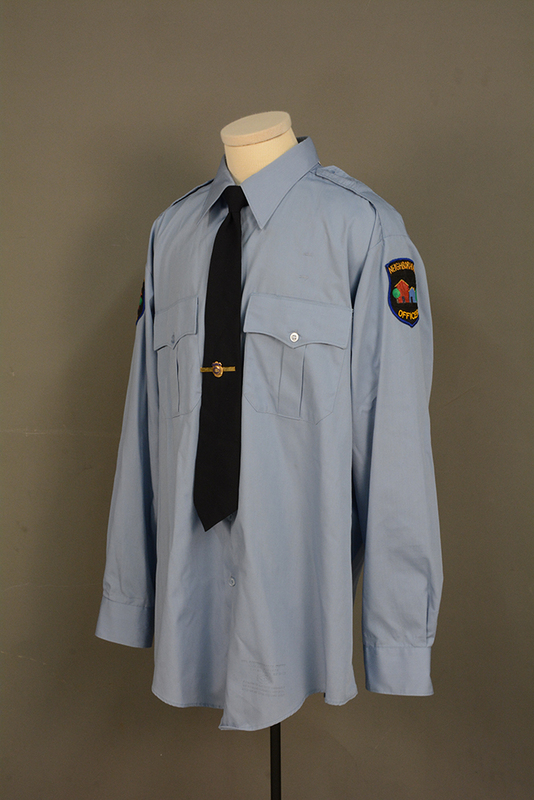 Officer Clemmons shirt and tie, c. 1990. Gift of François Clemmons. The History Center is proud to be the home of the “Mister Rogers’ Neighborhood” set in addition to other artifacts related to the television show, including one of his sweaters and a pair of sneakers, which have all become pop culture icons. In celebrating the 50th anniversary of the show’s debut and its enduring impact, we have a unique opportunity here in Pittsburgh — because of our access to the regional institutions and people who contributed to the show — to document and share all that went into making this local show a national success. 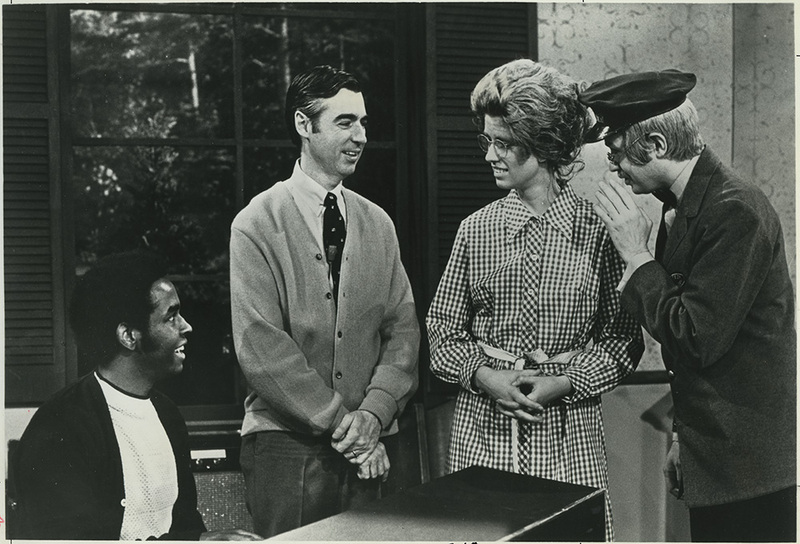 Fred Rogers thoughtfully crafted every episode’s themes, songs, and dialogue and consulted with local child development experts, especially his mentor Margaret B. McFarland of the University of Pittsburgh. The use of a diverse cast, puppet friends, and special guests helped children explore different (and perhaps new) personalities, conflicts, and experiences. Mister Rogers with Mr. and Mrs. McFeely in Clemmons’ music studio, May 4, 1972. On the show, Officer Clemmons also runs the neighborhood dance and performance studio. In this scene from Episode 1249, Mrs. McFeely receives a voice lesson while Mister Rogers and Mr. McFeely observe. Allegheny Conference on Community Development Photographs, Detre Library & Archives at the History Center. François Clemmons knows better than most how Fred strategically chose his cast and the role they played in the neighborhood. François met Fred while living in Pittsburgh and pursing a Master’s degree at Carnegie Mellon University. They attended the same church and Fred invited François to be on the show periodically after hearing him sing in the choir. When Fred approached him about portraying Officer Clemmons, a more permanent role on the show, he was not only reluctant, Clemmons was stunned. As an African American man who grew up in a poor neighborhood in the 1960s, he let Fred know that he did not have a positive view of police officers. Eventually he relented and agreed to the role because Fred expressed his hope that Clemmons could embody the “helper” aspect of police work and give children that grew up in a similar manner to Clemmons a different view of the public service provided by police. The character of Officer Clemmons appeared during the first year of the show in 1968, and Clemmons became the first black man in a recurring role on a children’s television program. Still image from Episode 1663, where Mister Rogers and Officer Clemmons soak their feet together, aired on February 24, 1993. Love was the theme for that week’s episodes. While soaking their feet, Officer Clemmons sang “Many Ways to Say I Love You.” This is the last time that François appeared on the show. Courtesy of Fred Rogers Productions. The most memorable episode his character appeared in aired in May 1969, when tension between police forces and minority residents was at its height and civil rights riots were taking place in cities across the country. Among the hot-button issues at the time were the ongoing resistance to swimming pool integration in the South and fierce debates over integration of schools in Pittsburgh. 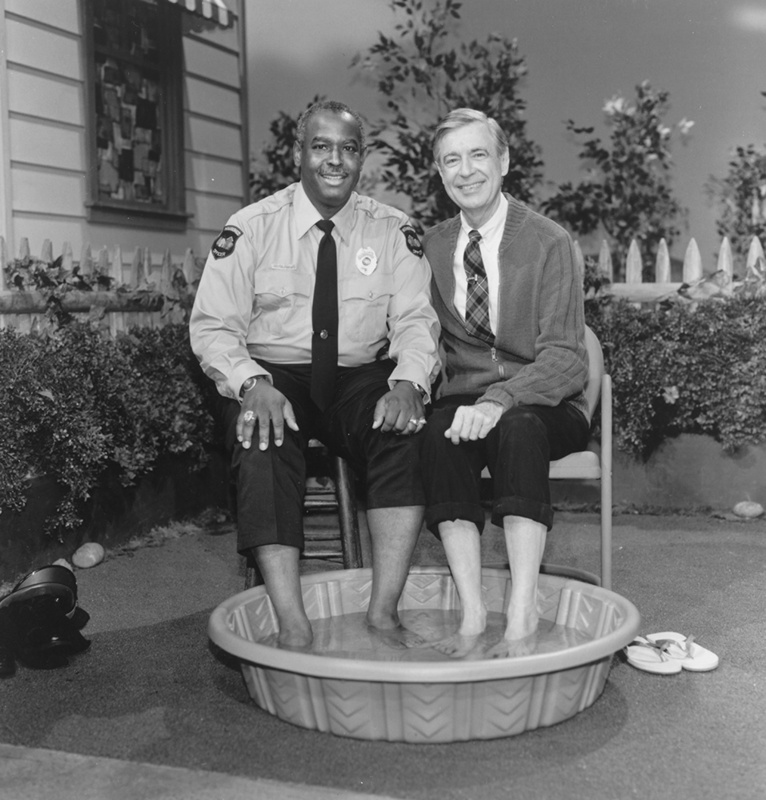 In this atmosphere of fear and distrust, Mister Rogers incorporated a scene into the episode where he invited Officer Clemmons to cool his feet with him in a children’s wading pool on a hot day. François recollects that he and Fred had many private conversations regarding continued racism in America, and Fred, who loved to swim, particularly disagreed with the resistance to swimming pool integration. Pittsburgh’s own Highland Park Pool received national coverage in the late 1940s over white swimmers’ refusals to allow blacks to use the public pool and the violence that ensued. Although the law technically stated that pools were integrated, there was still much de facto segregation at pools throughout the country. This simple scene of a black man and white man soaking their feet together on a children’s television show sent a powerful message to the nation about our common humanity. In 2016 François donated his Officer Clemmons jacket, shirt, and tie to the History Center collection. We hope more former cast and crew members will share with us their stories and artifacts related to their time on the show. Donations such as this add to the impact that “Mister Rogers’ Neighborhood” had on the lives of generations of children — and their parents too. StoryCorp interview and author interview with François Clemmons, Feb. 9, 2018. Author interview with François Clemmons, Feb. 9, 2018. Awesome article Emily Ruby! I loved watching Mr. Rogers as a child! My youngest daughter LOVED watching Daniel Tiger when she was ages 3-5. I of course knew where Daniel Tiger originated. We need more “helpers” like Mr. Rogers in our world today!